The towel your wheels have been waiting for. This soft, absorbent microfiber towel is especially great for wheels because it eliminates water spots and residual brake dust. Use the Microfiber All Purpose & Wheel Detailing Towel every time you clean wheels to leave them spotless! Towel-drying your wheels is almost as important as cleaning them! Just like any other surface on your vehicle, wheels are subject to water spots. The bright shine of metal is obscured by cloudy mineral deposits. Water spots are easy to avoid. 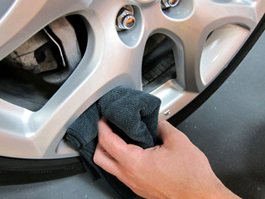 Just use the Microfiber Wheel Detailing Towel to towel-dry your wheels every time you clean them. Wipe away the water droplets and buff wheels to a bright luster. The Microfiber All Purpose & Wheel Detailing Towel also removes any residual brake dust and grime that is lingering on the wheel. Even after cleaning wheels, brake dust may be stuck between the spokes or in lug nut holes. 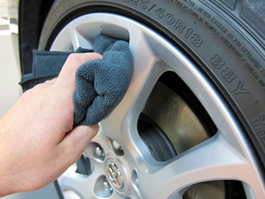 The soft microfiber loops grab and hold the brake dust particles with a magnetic charge, completely removing them from the wheel. Dry wheels after cleaning to avoid water spots. The Microfiber All Purpose Wheel Detailing Towel is black for two good reasons. First of all, the black microfiber hides stains well. Secondly, the black microfiber enables you to easily designate the Microfiber Wheel Detailing Towel for tires and wheels only. Color-coding your towels and applicators prevents cross-contamination. Buffing towels should only be used on paint, glass towels are only for glass, and these handy black towels are only for tires and wheels. The Microfiber Wheel Detailing Towel grabs residual brake dust. The Microfiber All Purpose & Wheel Detailing Towel is absorbent and soft. It will not scratch any finish, including factory clear coated or painted wheels. The 80/20 blend of polyester and polyamide is extremely tough. Even on the most rugged part of your vehicle, the Microfiber All Purpose & Wheel Detailing Towel holds up through countless uses. 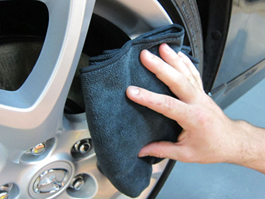 The Microfiber All Purpose & Wheel Detailing Towel is soft and safe on every type of wheel. Wash your Microfiber All Purpose & Wheel Detailing Towel in McKee's 37 Microfiber Cleaner and avoid using bleach or fabric softener. McKee's Microfiber Cleaner will clean and degrease the towel, while maintaining its soft texture and magnetic charge. Tumble dry on low heat or no heat. Do not use a dryer sheet. If the fear of blackened towels is keeping you from drying your wheels, get the Microfiber All Purpose & Wheel Detailing Towel. The black microfiber towel doesn't show the stains and it's easy to designate it for wheels and tires only. Now there's no reason not to buff your wheels to a clean, spotless shine. I am looking forward to using this product. It is very good for "all purpose and wheel detailing towel",but I don't recommend to use in buffing wax ,polish,AIO residues. ConsPricey if you buy one. It is great for cleaning dirty areas. I had to laugh when I first came across microfiber towels just for wheels and wheelwells and the wheel area in general. I have to admit though that having towels specifically for that part of the car makes sense and having it color coded to the area of the car I want to dry is a good idea. It helps to prevent cross-contamination and taking a chance of scratching the paint. I ordered a few of these to replace some older towels. They work great. ProsEffectively absorbs water. Specifically made for the wheel area Color coded for the wheel area. High quality.